The departure of community and family members to work elsewhere is a familiar feature of life in the Sierra Norte. As one man (Mexico 14) says: "Yavesía has its own means for living, including many people migrating to the USA." A farmer in his sixties (Mexico 13) tells of his regular yearly migrations to find work: ".in '62 I went to the mine for work - well, I needed money. After that I went to work in the Valle Nacional [in the Sierra Norte] where there is tobacco. I continued like this, year after year, I used to go to the USA every year for seven years; I wasn't there long, just two or three months". Another narrator (Mexico 7) speaks of his departure to Mexico City, for lack of an alternative means to make a living: "If I had thought about doing something in Yavesía well before.I would have stayed and not gone to Mexico City. I would be better off now because my land would have been planted with fruit trees, or something. I would live more peacefully." Many of those who have been "outside" speak of the poor health conditions in the mines, fields and factories where they worked, and of employers' prejudice against people from the mountains and Oaxaca state whenever skilled work was available: "We know how to work in the fields, and this is recognised . bending one's back in the long furrows in the valley of San Quitín. But [when it is not manual labour they want] they will give preference to the person who studied in the city rather than the person who studied in the mountains, right?" (Mexico 12). Working conditions and opportunities in Mexico City have further deteriorated, according to one narrator from Yavesía (Mexico 7): "Living in Mexico City isn't good anymore because the wages are very low now because of the problem of the free trade deal. The wages went down and the working class isn't recognised anymore. Promotion isn't seen; only casual labour is used because the machines are very good at doing the work - specialised labour isn't needed anymore. So if one doesn't have any qualifications or something from Mexico City, one can't get any work." A resident of Ixtepeji (Mexico 29) tell of his sense of obligation to the community, which drew him back: ".I worked on roads, I know a little of that type of work.I also [worked in construction] for about a year.I found a good job and I wouldn't have left my work if it hadn't been for the [need to take up the] cargo of regidor (community official responsible for supervising topiles and maintaining order). Then the engineer who was in charge of the work was telling me to [stay] with them instead of doing my servicio (cargo service), and I told him no, that my duty was here [in Ixtepeji], because I was born here and probably I would die here". Another narrator (Mexico 12) reflects on how the return home can involve considerable adjustments: "To change one's mentality is a difficult process. For example. It doesn't matter to the village if you have a degree or are a teacher, doctor or [other] professional, you have to do what the village asks you to. Knowledge will help you a little but the work . that you do with them, shoulder to shoulder.day after day, this is what will give you recognition.It is difficult to re-accept the principles of the village when it basically says that the good of the community comes before yours, isn't it?" Some try working away, but simply prefer being at home, like this young man (Mexico 5): ".I've been to Oaxaca but just for a while, it wasn't for long. I went for about a year, half a year.Well, to tell the truth, I didn't like the city because...nothing that one eats there fills you up like in this village, it's different." Others set up home away permanently and lose their links with the community (Mexico 13): ".my boy stayed in Mexico City. He's been there for a long time now; he married and has sons and education, and the oldest one has finished high school. I'm not sure what they're doing now because I haven't gone there for four years. I don't know what career he's chosen but he's studying so he can make a go of it, the oldest." In Yavesía (Mexico 12), a narrator recalls being brought up by his grandfather in his father's absence: "I can remember many things from my childhood, but maybe the most important thing that I remember is the teaching of my grandfather. Because my father worked away - he was one of the first migrants from Yavesía - so I mostly remember the teachings of my grandparents." Realistically, he says, migration will continue, despite creation of some alternative means of earning a living at home, because the motivation is not always just economic. "Well, I don't think that the migration will stop.They're not just going for the work, I mean to earn money; some are going to know and live new experiences, to know what there is over there. However, I think that we will be able to cut down on the amount of migration when there are alternatives for living well [here] .."
"Yes, the city is a centre of attraction, without a doubt. However, the big cities also have problems now; there aren't the same work opportunities that there were in the '60s and '70s.not even if you have enough education. you take your birth certificate and your certificate for the sixth grade of primary school and they tell you, no, well, he's from the provinces, he's from Oaxaca." "In the city, if you work you earn your food; but if you don't work, well, you don't eat. [Without] money I think you'd die of hunger there . people won't give you food." "I lived in the city and on returning here, the people, the community, my village have been re-educating me because I have to fulfil my [community] obligations. I had the bad habits of the city." "We're five [brothers and sisters], four women and one man. My brother is in Mexico City. My father, another sister and I [live in Tiltepec], my other sisters are in Oaxaca." 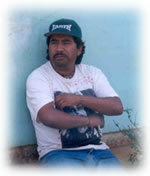 "I was working with a master bricklayer [in Oaxaca], I was helping him. after that we went to pave the roads there in the city and we did that for about a month.That has been the only work I've had that has paid me a little more, a little better."